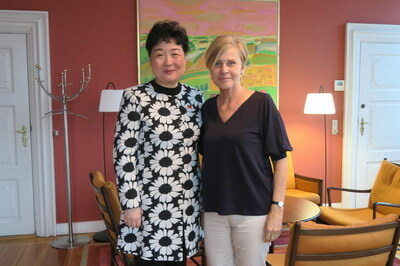 On May 1st, Ambassador Deng Ying met with Ms. Mette Bock, Minister for Culture of Denmark, who is also Minister for Ecclesiastical Affairs. Counselor Liu Dong attended the meeting. Ambassador Deng made positive comments on bilateral relations between China and Denmark. She noted that cultural exchanges and cooperation have become the new highlight of bilateral ties. The two sides also discussed cultural events celebrating the 10th anniversary of China-Denmark Comprehensive Strategic Partnership. Ms. Bock spoke highly of China-Denmark cultural exchanges, and agreed to take the occasion of the 10th anniversary as a great opportunity to deepen bilateral cultural cooperation.